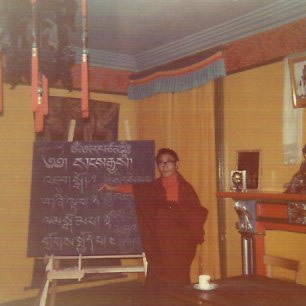 In 1973, Lama Karma Thinley Rinpoche visited Great Britain for a period of three months. Rinpoche spent most of that time at Edinburgh University. 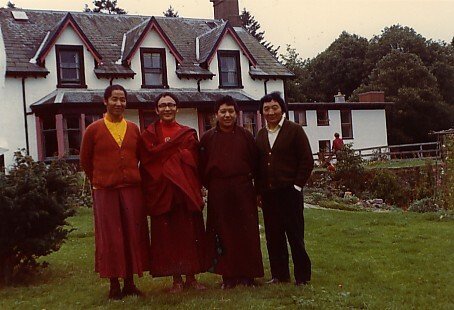 The rest of the time he spent at Samyeling in Scotland, as well as in England where he had a chance to visit Ato Rinpoche's home and also Chime Rinpoche's dharma centre Kham House. He also visited the Buddhist Society in London and gave some dharma talks. In Samyeling, he gave refuge to more than ten people, and taught Tibetan classes. Trungpa Rinpoche had already left at that time. This was the first of three visits Rinpoche made there. He found the Samyeling area very beautiful, and he says he felt homesick for his homeland when he heard the sound of sheep and saw magpies flying by. He also recognized one black bird that has a red beak and red feet, which is called chongka in Tibet. Sometimes Akong Rinpoche mixed butter and tsampa with frozen raw lamb, for them to eat in Khampa fashion. Rinpoche was invited to Edinburgh University by Dr. Barbara Aziz who is a Ph.D. in Anthropology. While there he corrected her thesis on the history of Dingri Langkor Monastery (Padampa Sangye's main seat) and the family anthropology of this area. Rinpoche also corrected some dharma books from the library. 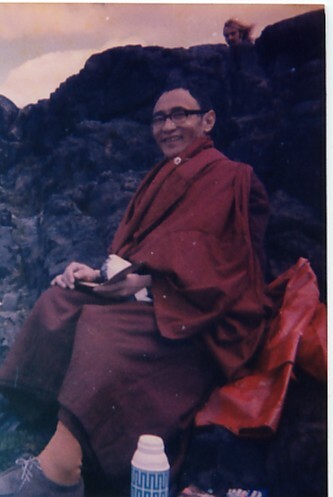 During his stay in Edinburgh, Rinpoche often climbed to the top of a special rocky hill that is shaped like a lion’s head and covered in thick grass. Also known as Lion’s Head by the locals, this hill is 825 feet high and allows a beautiful view of the whole city. Rinpoche wrote some poems, and some good omens also occurred at that time. One lovely day he went there with two friends he knew from the Young Lamas' Home School in Dalhousie (1963) who were visiting him, Pema and Yeshe Khandro. There were clouds shaped like leaves in the blue sky. They made a seat for Rinpoche, covered with a red cloth, and they hung a victory banner from the rocks. Rinpoche made a shrine on the circular commemorative brass plaque at the summit with his special (dralpang) buddha statue, shrine bowls, tea, and sweets, and they performed a ganachakra puja. At that time, Lama Karma Thinley Rinpoche had no idea of starting any dharma centres in the U.K. However, some of the good omens that had occurred indicated that he would eventually open many centres there. 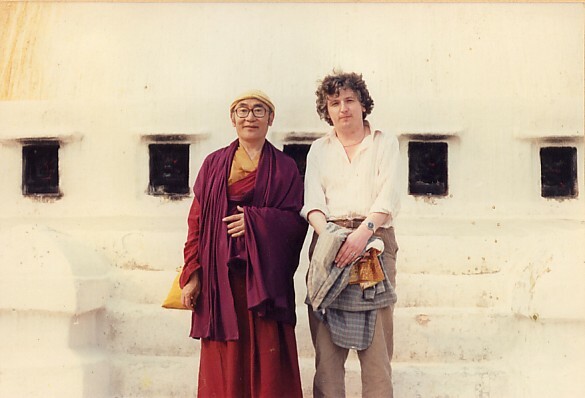 Karma Thinley Rinpoche first met David Stott in Samyeling. There, he gave him refuge and the name Ngakpa Jampa Thaye. Later, Karma Thinley Rinpoche appointed him as his regent and gave him a letter of authority that he sealed using his special seal that His Holiness Sakya Trinzin had presented to Rinpoche. Lama Jampa Thaye is a scholar and practitioner. He has a PhD in Comparative Religion, and he taught many years at the University of Manchester. He has written and published several wonderful dharma books. Karma Thinley Rinpoche initially established the Mikyö Dorje Institute in Toronto. It no longer functions there, but was later started up in England, where Lama Jampa Thaye gives courses on important Buddhist philosophy, for example, the Bodhicaryavatara, Uttara Tantra, The Jewel Ornament of Liberation, Seven Point Mind Training, etc. Together, Karma Thinley Rinpoche and Lama Jampa Thaye founded many Karma Kagyu and Sakya centres, as well as the Mikyö Dorje Institute, all of which are now collectively known as The Dechen Community.